Did you know you can use certain wart removers for skin tags? Warts and skin tags are both benign growths. While many times different types of treatment are necessary, when it comes to freezing skin tags or warts, it works for both types of skin growths. Compound W Freeze Off is an at-home solution for freezing off skin tags safely. 1 What is Compound W Freeze Off? 1.2 Won’t My Insurance Cover Skin Tag Removal? 1.3.1 What Does the Freeze Off Kit Contain? 1.3.2 How Does Compound W Freeze Off Remove Skin Tags? 1.3.3 Will I Get Fast Results? 1.3.4 Are There Risks to Freezing Off Skin Tags at Home? 1.3.5 What Are the Advantages and Disadvantages? What is Compound W Freeze Off? 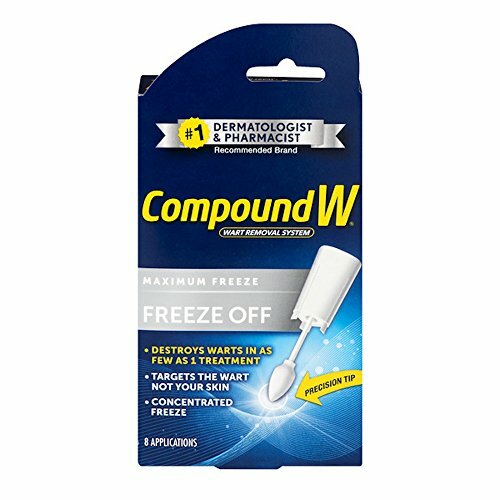 Compound W Freeze Off is the number one brand recommended by dermatologists to freeze away skin growths like skin tags and warts. It uses similar technology to what a doctor or dermatologist might use when getting rid of skin tags at their office. Freezing off these growths is called cryotherapy (when performed by a doctor). It works by freezing the actual structure and cells of the skin tag quickly. Doing so destroys the tissue and prevents blood flow to the skin tag. Without any blood flow, the skin tag will fall off in a matter of days with no extra treatment required. It is one of the fastest and most painless removal methods for self-treatment at home. Won’t My Insurance Cover Skin Tag Removal? Skin tag removal isn’t usually covered by insurance unless your doctor feels there may be another underlying medical problem. Skin tags are often considered as more of a cosmetic blemish than something that would need to be dealt with to protect our well-being. Thankfully, freezing warts or skin tags at home has become a viable and affordable option, thanks to products like Compound W Freeze Off. It’s for more than just warts and can be a faster at-home solution for getting rid of skin tags than many other creams or topical solutions. Let’s take a closer look. This review will focus on what you need to know about Compound W Freeze Off. Freezing is a proven method, but many people may still be hesitant to try it at home because they either don’t understand how it works or they are afraid to try removing the skin tags themselves. Making sure you use a product that is safe is important, so it doesn’t damage your skin. With Compound W Freeze Off, you don’t have to worry about dealing with messy creams or oils. It’s quick and convenient and easy to use. Let’s look at what you can expect when using it. What Does the Freeze Off Kit Contain? To successfully freeze off skin tags on your own, you need the right tools. This treatment kit contains everything that you need to get results without having to purchase items separately. An aerosol can that contains the main ingredient, dimethyl ether. This is the freezing agent that will immediately stop the skin tag from receiving the oxygenated blood that it needs to survive. How Does Compound W Freeze Off Remove Skin Tags? The treatment freezes the skin tag’s cells and tissue, so it can’t continue to thrive. When a skin tag does not get what it needs to survive, it will eventually fall off. This is a similar method to what your doctor would use, but it’s safe enough to use in the comfort of your own home. With that being said, it’s vital to use Freeze Off correctly. Since it works by freezing the skin tag itself, you should try to avoid getting it anywhere else on your skin. Place the can on a flat surface, like a table. Hold onto the collar of the can, then twist the cone counter-clockwise to the “1” position. When it is locked into the “1” position, push down on the cone for three seconds. Do not touch the metal tip while doing this. When you hear a hissing sound coming from the can, you’ll know it’s activated and ready for use. Return the cone to its starting position. Wait two seconds, so the applicator tip has a chance to freeze. Then, apply the tip directly to your skin tag. Hold the tip against the skin tag for up to 20 seconds for best results. Be careful to use the tip as suggested, and not touch it to other areas of your skin. Will I Get Fast Results? There may be a slight stinging sensation to the area after you’ve used the freezing agent. This is normal. You might even compare it to how minor frostbite feels. As soon as your skin warms up again, the stinging feeling should go away. The skin tag should change color and drop off on its own in a few weeks’ time. The manufacturer suggests that in just 10-14 days, it can fall off. Larger tags may take longer. This is a faster method than many of the creams and other solutions on the market. Depending on the size of your skin tag, you may be able to get rid of it with just one treatment. If the skin tag hasn’t gone away after a few weeks, repeat the treatment process. Are There Risks to Freezing Off Skin Tags at Home? Because cryotherapy is a medical procedure, it can feel intimidating to do it at home. Doctors usually use liquid nitrogen to freeze off skin tags. Liquid nitrogen can be dangerous to use, and it isn’t recommended that you try using it at home for the same purpose. But, there are safer freezing methods and ingredients. Compound W Freeze Off uses dimethyl ether. This is a safer freezing agent for home use. But, you should still take precautions when using it. The precision applicator on the can itself makes it easy to target skin tags of any size. You should only touch the skin tag and not your surrounding skin. If you do, you risk freezing other skin cells, which could cause damage or irritation. There are precautions you should take when using this product. It is safe when used correctly. This treatment uses an aerosol can that contains highly flammable ingredients. Keep it away from open flame. This product is suitable for children over the age of four. If you want to use it on a child under that age, contact a doctor first. If you have skin tags in sensitive areas, like the eyelids or groin, avoid using this product. Never spray anything near your eye. In some cases, more than one treatment may be needed to get rid of a skin tag. If the growth starts to change color or shrink after using the product, don’t pull or pick it. This could lead to bleeding and infection. Instead, treat it again with the solution after a few weeks. Compound W doesn’t have many disadvantages, but there are some things to consider. It mostly depends on where your skin tags are located, and if you have any underlying health conditions. No product is perfect, so let’s break down some of the pros and cons of this treatment. So, is this the best treatment option? If you have skin tags on areas like your neck, or under your arms, it just may be. It is certainly one of the fastest ways to get rid of them. But, if you’re dealing with a skin tag around your eyelids or in other sensitive areas, you may want to choose something else. Compound W Freeze Off continues to get great reviews by those who use it. It may be marketed as a wart remover, but its alternative use is clearly for skin tags. If you don’t want to go to the doctor to get your skin tags removed, but want a quick way to do it at home, this is one of the best options. It does need a careful application, so a steady hand is needed. But, if you have skin tags that aren’t in sensitive areas, you can get rid of them in as little as one treatment. We may not know exactly what causes skin tags, but some people seem to be more prone to them than others. Compound W Freeze Off gives you the benefits of cryotherapy at home. It is the leading alternative to Dr. Scholl’s Freeze Away Wart Remover. You can get rid of skin tags quickly without having to spend hundreds of dollars at the dermatologist’s office. While there are other treatment methods like topical over-the-counter solutions, they can sometimes take months to work. Freezing your skin tags off doesn’t require any messy creams or ointments, and really kills the structure of the growth itself. That way, you know it’ll fall off as quickly as possible. If you’re looking for a fast skin tag removal at home, consider freezing them away with Compound W Freeze Off. It mixes the success of cryotherapy with the ease and convenience of a home remedy. Whether you have one skin tag or a few, you can count on it to safely freeze them away. After freezing your skin tags using Compound W Freeze Off, you will want to take care with the treated area. Gently cleanse the area twice daily with warm water and a mild soap and refrain from soaking the area for at least the first twenty-four hours. You will also want to protect the area from sun exposure or else you may experience minimal scarring following treatment. Furthermore, if you experience any bleeding, discoloration, pain, or any kind of discomfort, you should consult with your doctor or dermatologist right away. If you follow the instructions closely and take the necessary precautions following skin tag removal, you will be well on your way to an unblemished appearance. CLICK HERE to buy Compound W Freeze Off on Amazon! Compound W Freeze Off definitely is one of the fastest and most effective products when it comes to safely and effectively removing skin tags at home. This product can remove skin tags that are up to 3mm in size across and all the instructions, and everything else you need are included in the kit. If the skin tag you are trying to remove is located in an awkward area and is a bit hard to see, try using a mirror for better visibility. You want to be able to see what you are doing and where you are applying the Freeze Off. Before you begin to use the product, make sure to read through the instructions. If you follow all the steps closely, then you should hear a hiss when you hold the can upright and press the holder down with your other hand. If you do not hear a hissing sound when prepping the can, then it may be defective, and it will not work properly. If this is the case, do not use the can and call them at 1-800-443-4908 for a replacement product. Compound W Freeze Off can remove skin tags in as little as one application and is one of the easiest over the counter skin tag removal products available.